They cost more than ordinary ones, but they are a better value. You get more for your money, as reasons 1 to 5 below demonstrate. Some luxury safaris have exclusive traversing rights to the best locations. This means superior wildlife sightings. 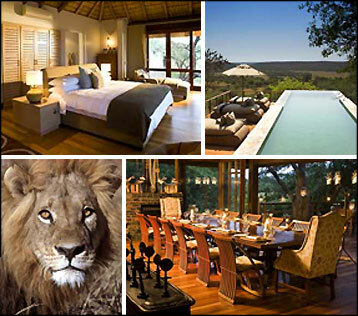 Some luxury safaris (especially in Kruger) have exclusive traversing rights to the best locations. This means superior wildlife sightings. They are more carefully selected, better trained, and more eager to find the animals for you. You seldom see a bevy of vehicles surrounding a lion like a swarm of paparazzi. And seating is usually two, not three abreast. The staff-to-guest ratio is high, employees are more professional and hospitable. They pamper you. They remember your name, how you like your martini, and more. Your cottage, tent, whatever will be a haven for relaxing and refreshing after game drives. Everything from the main lodge building to the pool - is a soothing environment. It's several notches higher than found in mid-range lodges. And you have a wider menu selection.